So will he ever speak? When Braxton first got his G-tube at 2 weeks old, inevitably the first question I was asked after explaining his tube to family, friends, and strangers was, “So will he ever be able to eat by mouth?” For the longest time my response was, “I don’t know,” and we genuinely did not know. Once we started working with a Speech Therapist and making progress, that “I don’t know,” turned into “Yea, more than likely he will be able to eat like you and me, but he’s still learning.” Nearly 3 years later and you would never know there was a time he couldn’t eat. He still uses his tube for liquids, but he eats all of his meals by mouth. He still only eats purees, and we continue to work toward table food, but he IS eating. Our journey to communication has been similarly riddled with questions and uncertainty. When we learned of his hearing loss, we quickly began learning sign language. Family and friends asked “Do we need to learn sign language, too?” I don’t know. Braxton did not pick up sign language as quickly as we had hoped and it seemed almost pointless to make our family learn, too. Instead, we encouraged them to continue speaking to Braxton just as they would any other child. That constant exposure to language was still just as critical. We hoped for verbal language, but were never sure if it would come. When we finally received the diagnosis of Rubinstein-Taybi Syndrome (RTS), we learned from other families that many of the children are non-verbal and use sign language or a communication device to speak. There are many who have at least some words and a few who are very verbal. Where would Braxton fall on that spectrum? I don’t know. By that time, we had already started on the path to high tech Augmentative and Alternative Communication (AAC), and the diagnosis confirmed this was the path we needed to pursue, always holding on to the hope of verbal speech. We saw little progress at first, but we saw enough to keep hope alive and to continue this path. The dream has always been (and will always be) verbal speech, but the goal is communication. Communication using whatever means necessary. As we have worked on using Speak for Yourself, a communication app on the iPad, quite heavily in the past year, the inevitable question has become “So, will he ever speak?” I don’t know. I don’t know if he will ever speak. I don’t know if we will ever hear his precious little voice. I don’t know if I will ever have the chance to tell him to stop talking. (I don’t know that I would ever want to say that after waiting so long to hear him). I don’t know what the future holds. We simply hope for the best. I know that by pursuing AAC we are giving him a way to communicate with us NOW. I know that AAC is giving him his best chance to succeed. I know exactly when he wants hugs and kisses, because now he can tell me with his talker. I know exactly which toy he wants to play with. I know that he likes to read. I know that he likes to be outside. How do I know? Because he can ask for it himself using his communication app. To see this explosion of communicative skills grow right before my very eyes is nothing short of a miracle. Today, he was roaming around the living room with a slight whine and I tried so hard to find out what was wrong. He had just eaten not long ago, he had a fresh diaper, and he was playing with his toys. I looked around to see if a toy was broken or not working as intended, but nothing. I sat down and rhetorically asked what was wrong. Braxton saw his talker and walked right over to it, turned it on and hit “sleep” repeatedly. Then he climbed on to the couch where I sat watching him, laid himself down in my lap, pulled my arm around him and closed his little eyes. The dream is verbal speech, but the goal is communication. Braxton just purposefully and successfully communicated to me that he was ready to go to sleep. Because of AAC, we can check that goal off our list. Braxton now has a way to communicate and interact with the world around him. He can tell me what he wants, he can tell me what he likes, he can tell me that he loves me, he can tell me anything he wants, because we have provided a means to do so. 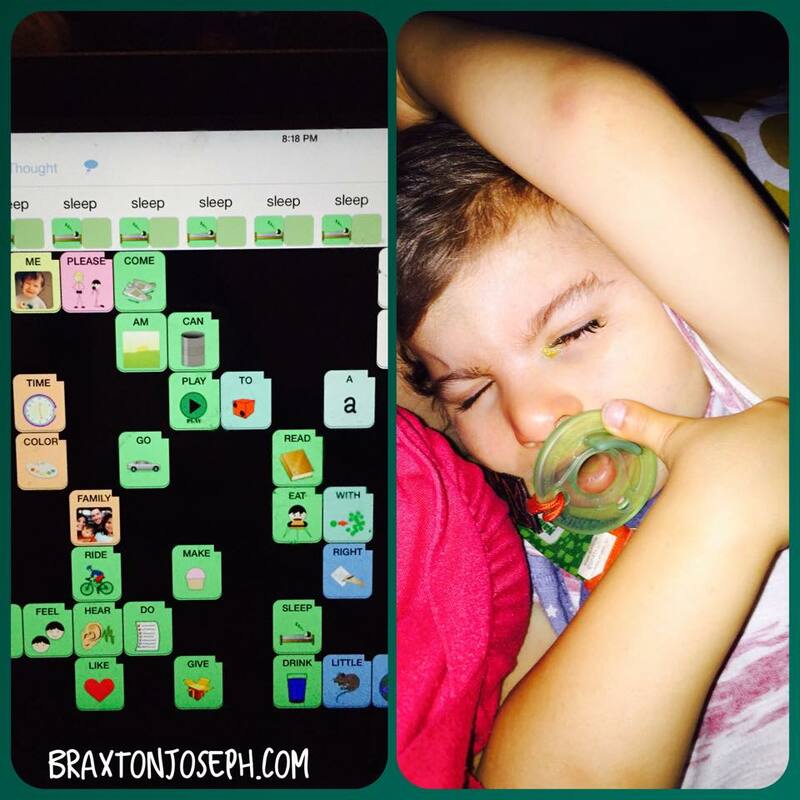 Speak for Yourself has given Braxton a voice. A voice he is learning to use quite well! So, will he ever speak? I don’t know. I haven’t given up on verbal speech. I would still LOVE to hear his voice, but I LOVE that I now have a way to know what’s going on inside his beautiful mind even more. One day, maybe he will verbally talk to us, but for now, he’s communicating and I couldn’t ask for anything more than that. It fills my heart with joy just reading your post. I’m so excited that he’s communicating! We all take our speech for granted, so it’s hard when someone can’t, but you know what? As long as he can communicate with you, I think that’s amazing and he’s perfect just the way he is now. Sending positive thoughts your way. I hope you get to hear his voice some day soon.